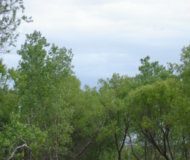 On a chilly morning on a late April day, the small community of 35 hardy souls was sitting together on a bluff overlooking a cottonwood and willow bosque. Little pools of water reflected (at times) a bright cheerful sun, but scudding low clouds kept bringing shadows that brought shivers to the little group. About 20 kids and 15 adults were staying busy – except for the littlest kids of course. The smallest kids (five and under) were running back and forth through camp, picking up rocks and chunking them over the bluff, throwing handfuls of dirt on each other, and chasing the one dog present. A couple of older kids were sneaking through the brush not far from camp, seeing how close they could come before someone would notice them. 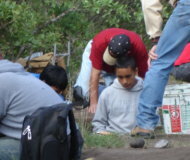 Three folks in their late 60s were working with some of the teenagers. One younger man seemed to be in charge – he kept roaming back and forth in the camp, instructing not only the youth but some of the other adults. Talk of boiling rocks, arrowheads, and buffalo bones seemed to be the order of the day. I grinned at my fantasy – I was sitting on the bluff with the people, but they were not American Indians, but Rick Day's eighth-grade students from Andrews, five other teachers, and members of Rick's extended family. Actually, one was an Indian, a Cherokee – William Cochran, a principal from Gordon, (near Weatherford) and Rick's brother-in-law. The landowner (and author of "A hundred years of gathering, a history of Motley County") MariSue Potts, was also present. 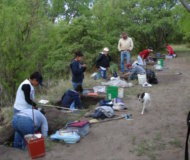 All were investigating a 600-year-old archaeological site a few miles west of Matador, Texas on a three-day weekend. The teenagers were focused – each pair worked on a grid, carefully scraping soil into dustpans which were emptied into buckets which were sifted through big shaker screens. 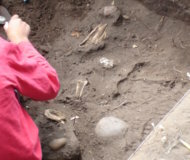 Those that had reached artifacts were busy mapping those artifacts – taking four measurements to give a 3-d record of exactly where each artifact rested before being carefully bagged and placed in labeled tupperware bins. 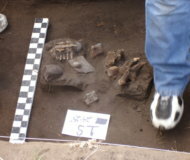 Before they were carefully lifted out of the soil, Rick's wife Susan (and a teacher at the Andrews High School) photographed the artifacts, first placing a measuring stick and labeling card next to the artifacts before snapping the shot. She also photographed the participants for a PowerPoint presentation (set to music) later given to parents, Andrews ISD administrators, and other interested citizens of the town. Coach Steve Butler, Coach Johnny Cordell, history teacher Felder Hogan, and astronomy teacher Charles Hemann of the Andrews Middle School assisted the students when needed, shaking the shakers, carrying buckets of soil, and most importantly, talked with the kids. I witnessed superb mentoring – quiet heartfelt advice and encouragement. The group was a community – a happy cheerful gathering – which lead to my momentary fantasy that I was sitting watching the same number of people actually process the dismemberment and cooking of recently killed buffalo. The kids had come in a school bus, and were staying in tents owned by the school. Adults did the camp cooking. 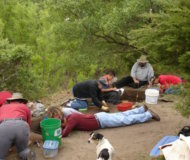 The campsite was a quarter mile from the archaeological dig, on a green grassy terrace shaded by old cottonwoods close to the shallow waters of Mott Creek. An outhouse was hidden nearby in a thicket of wild plum, skunkbush sumac, and elbowbush. 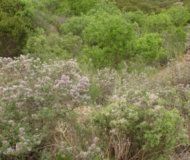 The hills were sprinkled with wildflowers that had just begun to bloom the week before – and nearby soapberry trees had not quite finished leafing out. Spring comes three weeks later than it does in Midland – two hundred miles to the south. I found over 100 species of plants (fifty of them in bloom) when I strolled around between the two centers of activities. 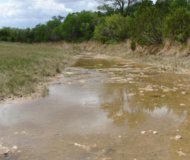 In the bosque below the site, goldenfronted woodpeckers chuckled and whooped as courtship began. Bright red male cardinals chased drabber females, constantly singing "syrup,syrup." Once in a while a turkey would clack a warning note, but they stayed out of sight for the most part. A chilly northwest wind kept the cottonwood leaves whispering, but down below, behind the shrub oaks, wild mulberry, and chittamwood trees a slight breeze could only push the dust cloud from the shakers a few feet. The soil was dark – almost black – and everybody had big smudges on their faces and arms and fingers blackened and gritty. 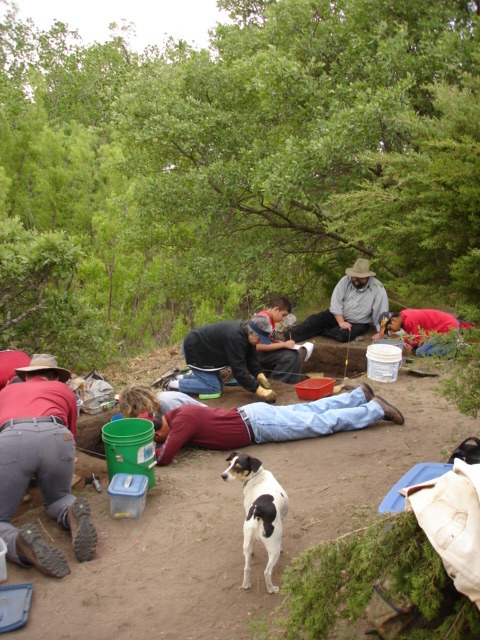 "You girls have done a better job than experts – I have seen photos in the Texas Archaeological Society journals of exposed artifacts "in situ" that were not as well manicured and leveled," Rick said as he complimented Erica Jiminez and Danielle Alaniz before the lunch break. He hollered for everybody to come admire their work. In the afternoon the girls carefully mapped what they had found. 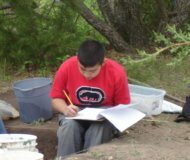 Danielle has wanted to be an archaeologist since the fifth grade. 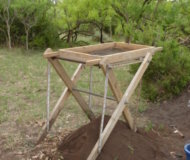 Late in the afternoon the same two girls brought a bucket of soil for sifting – and three small arrowheads were left behind in the shaker. "A Harrel, a Fresno, and a Harje twist – all buffalo hunting points. The Scallorn points are deer points, and are a little older. Some people think the buffalo points came with the Apaches when they moved south. Maybe the points were traded and came before the Apache. 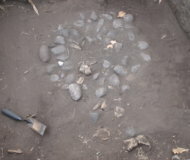 With the pottery we have found, we believe this is more likely a Jumano site. 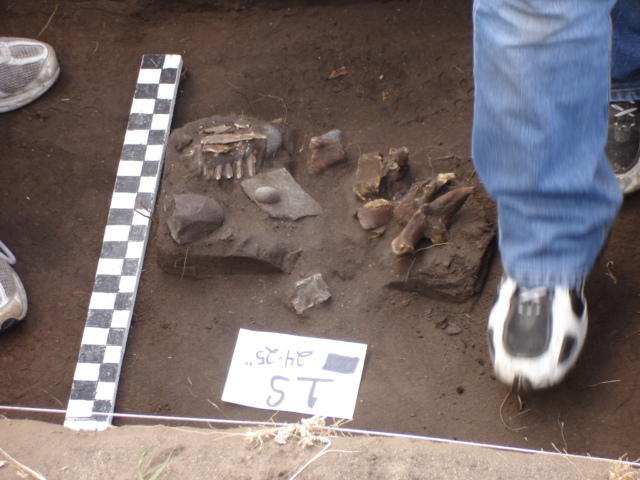 It is possible that buffalo returned to this area about the same time as the Apaches – that is one of the fascinating things about archaeology – after gathering evidence and comparing with the results of dozens of other digs, a person can try to interpret the information."